Lee Eckhardt, MD, MS, is a clinical and research electrophysiologist and treats a wide variety of arrhythmia conditions particularly conditions that cause ventricular arrhythmia or sudden death. 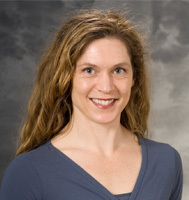 She is an expert in inherited arrhythmia conditions and directs both clinical and basic science arrhythmia research projects related to these interests with an overarching goal of prevention of sudden cardiac death (SCD). She also co-directs the Inherited Arrhythmia Clinic and the Cardiac Arrest Prevention Program. For more information about her research program, click here. Medical School George Washington University School of Medicine and Health Sciences, Washington, D.C.
Dr. Eckhardt’s research interests are related to the cellular mechanisms of inherited arrhythmia syndromes and cellular electrophysiology.